- from http://www.newyorker.com/ no copyright information shown, I believe this is a publicity shot, whatever the case, permission to reproduce is by this requested. 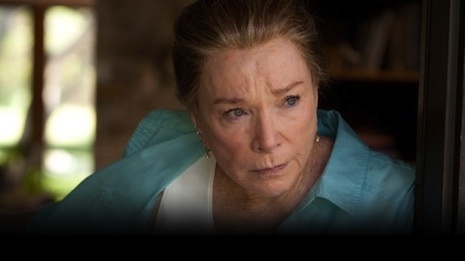 Ms. MacLaine has made her long journey through life public through numerous books. While believing that she has been ten years ahead of everyone else in the exploration of her mind, what has really been the case is that she has mistaken being ten years ahead of the people she knows while being essentially a trend-follower. What she describes in this book can therefore be understood to be either her active process of letting go, having understood it's advantages in peace of mind, or it can be seen as the inevitable process of age stripping away opportunity. Who knows? Either way we can benefit. And this is an easy read. What readers here can use to advantage in this book are the descriptions of various situations formerly grasped tightly, now, mostly let go and the results of this process as she experiences them. Most, if not all of her experiences will need to be dealt with by most if not all of us. It's good to see what other people have done to cope. This is really the first of Ms. MacLaine's books in which she has managed to avoid preaching in favor of description and the result is the reader is finally given an opportunity to see the person she is confronting the world she is living in. As it happens, letting go is a big deal, maybe the biggest deal in the process of Awakening, and the descriptions in this book of numerous real-world lettings go are instructive. She may not be ten years ahead of everyone, but in reaching old age she has experiences from which those who are ten years younger (either in mind or body) can profit. Ms. MacLaine has a misunderstanding of what is happening in the October 21, 2012 end of the world Mayan Calendar situation. She has repeated the common understanding that the phenomena that will cause the cataclysm is the (rough) alignment of the Sun, Earth, and the black hole at the center of the Milky Way Galaxy located in Sagittarius called A2. This is not the 'troublesome' phenomena: it happens once a year. Copyright holder unknown. If this is your image, permission to republish is hereby requested. The unusual thing is the once-in-26,000-year occurrence of the situation where this solar system, sitting on the edge of one of the petals of the pin-wheel that spirals out from A2 that is the Milky Way will pass from A2's northern hemisphere across it's equator to it's southern hemisphere. Think of the earth moving from the north of the sun's equator to it's south every year causing the seasons. At this time it is hard to imagine that there could be much in the way of physical disruption as such a thing would have begun manifesting itself already in great disruptions. The so-called global warming and odd weather patterns we are currently seeing could be a manifestation of this event, but in that case we should be happy as it is almost insignificant in the greater scheme of things. There has been speculation that the result might be a change in the Earth's polarity. But we could imagine a thing like the way the water in the southern hemisphere circles down a drain in the opposite way from the way it circles down a drain in the northern hemisphere, but that phenomena is happening to the earth, not the sun. In other words as an analogy of what might happen, it doesn't work for the relationship between the Earth (or the whole solar system) and A2 as that is a phenomena that would be occuring on A2, not to the solar system. And that gives us a clue as to what is likely to go on: nothing much. There is a balance between the forces exerted by A2 and the matter making up the Milky Way and the rest of the Universe. That balance is not likely to be altered much by a change that occurs as frequently as every 26,000 years. The effects of previous occurances could be seen. On the other hand, my theory is that there will be mental change: everything comes to a stand-still for a few cosmic minutes as we pass over the equator, we all do the hoky-pokey, and then begin to live normally, but going backwards through Time. I also really like the one where the result is that everything just stops. They ran out of tape (film, disk-space). American Indian humor where the story-teller just ends the story without providing any conclusion. OK OK there is (at least) one other possibility: the insanity of the people here today could be brought to focus on this event and result in total social chaos if there is enough scare-propaganda to create panic in enough people. Stay calm, tranquil, cool! It could be a Rudgerd Kipling, ... if you can keep your head when all about you are loosing theirs and blaming it on you ... then you are a sapurisa, my son, sort of thing. 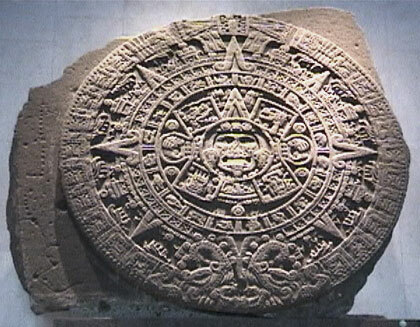 See http://www.webexhibits.org/calendars/calendar-mayan.html for a good explanation of the workings of this calandar.